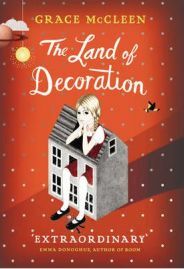 The Land of Decoration is a first novel told in the voice of a young girl who has been brought up as a member of a religious sect; Grace McCleen is a young writer who was herself brought up in a similar environment, and she is probably writing about things that she knows. Of course, most authors draw deeply on personal life experiences as they write, not surprising since writing about events and circumstances you know is likely to be more realistic and easier. However, sometimes the parallels between events and a novel and the author’s own life seem particularly close – Anthony Powell’s Dance to the Music of Time sequence being a good example – and perhaps that is also the case here. Certainly, the setting of the novel is completely convincing, even if the events are at least partly imagined. There have been a number of successful recent novels told in the voice of a young child, so the approach is by no means completely original. However, for it to succeed requires considerable technical skill as a writer as well as considerable imagination, and in The Land of Decoration Judith (the narrator) convinces completely as a somewhat precocious young girl. The book is a little slow to get going, but ultimately the world it creates is completely engrossing and I found difficulty putting the book down at some points. Judith lives with her father, and it is clear from the outset that her mother is dead. Judith has been brought up as a committed member of a small Church which operates under strict rules and is clearly closely modelled on the Jehovah’s Witness movement. Judith stands out from her schoolmates, both for her intelligence and for her religious differences. As a result, she is isolated and bullied, and retreats to an imaginary world which she makes in her bedroom. Judith comes to believe that she has been given the power to perform miracles, and that when something happens in her model world it will be paralleled in the real world. At first it seems to her that this will provide a rapid solution to her problems, but she quickly comes to realise that the consequences of our wishes coming true can be hard to predict, and that perhaps the adults in her life do not truly believe all that they say. There are many strong aspects to this novel – the voice and personality of Judith, her relationship with her father, the portrayal of the Church and its congregation and the reality of bullying in the school. There are also some unexpected aspects – the unseen social factors which turn a child into a bully, the impact of isolation on the development of an intelligent child, the impact of a strike in a closed community. The portrayal of the Church is not particularly sympathetic, and some readers have objected to this, but neither is it unreasonably harsh. But above all my memory will be of Judith and her imaginary world, which is a memorable one. Finally, I need to comment on The Land of Decoration as an object. As e-books become ever more popular, publishers need to work harder to make us buy their books. I read the first edition hardcover from Chatto &Windus, and it is a truly beautiful book. Coloured page edges (like an old-fashioned Bible), pictorial endpapers and a superb dustwrapper. Who would choose an e-book over an object like this? No Comments on "The Land of Decoration"